Abraham Lincoln was the 16th President of the United States and he had a dog named Fido. Fido lived with Abraham and his family when they were living in Springfield, Illinois. Once Abraham was elected as President, it was time for him and his family to move in to the White House. They decided to leave the dog behind in Springfield because, back then, they didn’t think the dog would have survived the long train ride to Washington. Unfortunately, a year after Lincoln was assassinated in 1865 Fido was also assassinated after a drunk stabbed him to death. It is not totally clear what breed Fido was. Bill Clinton was the 42nd President of the United States and he had a Chocolate Lab named Buddy. Buddy was named after Bill’s late great-uncle. In the press, Buddy was notoriously known for having bad house training manners. It was said that he feuded with the white house cat, named Socks. He also tore through socks and he wasn’t quite house broken. It was reported that Buddy passed away in 2002 after he was hit by a car near the Clinton family home in Chappaqua, New York. Before his passing in 2002, Hillary Clinton wrote a children’s book featuring Buddy and Socks titled Dear Socks, Dear Buddy: Kids’ Letters to the First Pets. Lyndon Johnson, the 37th President of the United States, had four Beagles named Him, Her, Edgar, and Little Beagle Johnson. There were several incidences that made the public question Lyndon’s love for his dogs. He would publicly pull the dogs’ ears in front of the press because he thought it was cute but the public thought it was too aggressive. Johnson had many other dogs including a mixed breed named Yuki and a white collie named Blanco. Ronald Reagan, the 40th President of the United States, had several dogs but only a couple were lucky enough to make it into the White House. One of those lucky dogs was a dog named Lucky! Unfortunately, Lucky, a Bouvier des Flandres, didn’t have much luck. The dog seemed to be a bit too rowdy and aggressive and was removed from the White House. It was reported that Lucky would chase Nancy Reagan across the great lawn. 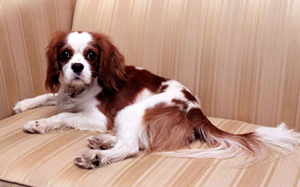 Rex, who became the First Dog of the United States, was a much calmer Cavalier King Charles Spaniel. Rex had a decked out dog house. Inside there was décor and framed pictures of Ronald and Nancy Reagan. 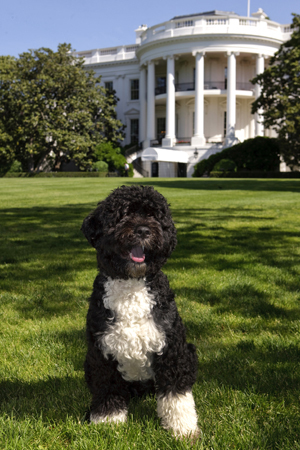 Barack Obama, the 44th President of the United States, has a Portuguese Water Dog named Bo. Portuguese Water Dogs have “hypoallergenic” coats, which greatly contributed to the decision of which breed the Obamas would choose because their daughter, Malia, has allergies. Bo was a gift from the Kennedy family, so some criticized the Obamas for not getting a rescue dog. The Obamas responded by showing their support to rescue dogs and pledging to donate to Washington, D.C.’s Humane Society. Bo has been featured in many children’s books since making his way into the White House, including a book by the President titled Of Thee I Sing: A Letter to My Daughters. Bo has also been featured on Dogs 101 and he has become a Ty Beanie Baby!